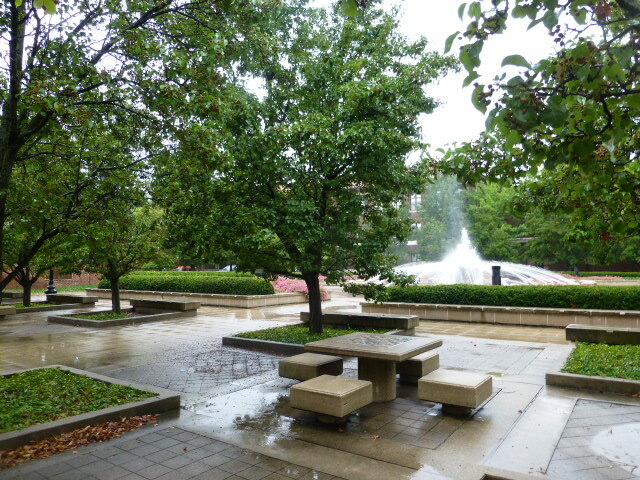 Twenty-three astronauts, including Neil Armstrong (for whom their engineering building is named), graduated from Purdue. 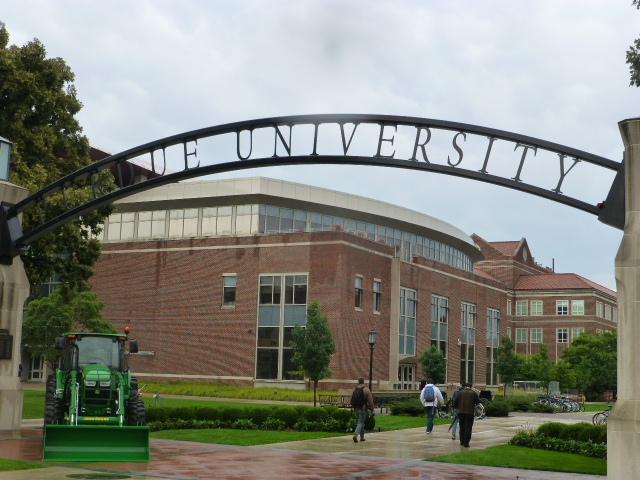 Purdue is Indiana’s land-grant public institution, home to 29,400 undergraduates: 57% are male, 57% are in-state, and 17% are international. We visited on a drizzly day, but the students were out in droves. The level of diversity seen in the student body impressed me. 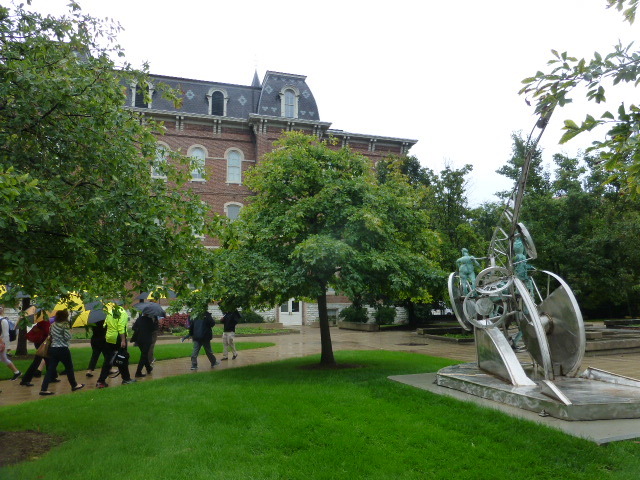 As part of the counselor tour, some of us chose to ride the “Boilermaker,” a small “train” that goes around campus. We had about five minutes to talk to the students who ranged from sophomores to seniors. Most were in-state; 2 were from other Midwestern states. They were all thrilled with their education and excited to talk about their experiences. One student said that she was surprised at how manageable the campus felt for such a large school; the others agreed that it feels small quickly through the majors, living communities, clubs, etc. Three were involved in Greek life (about 20% of all students are, making it one of the largest Greek systems in the state). The unaffiliated ones didn’t feel left out of the social scene or pressured to rush. The President who was a 2-term Indiana Governor. He’s making some good initiatives, including freezing tuition for 3 years. The town. It’s very walkable with lots to do. They are two hours from Chicago; shuttles run all the time. (Freshmen are not allowed to have cars on campus because of parking limitations). SPORTS! Students can buy a “Boilermaker VIP card” for $250 which gets them tickets to the games. The strong ROTC program in all 4 branches. 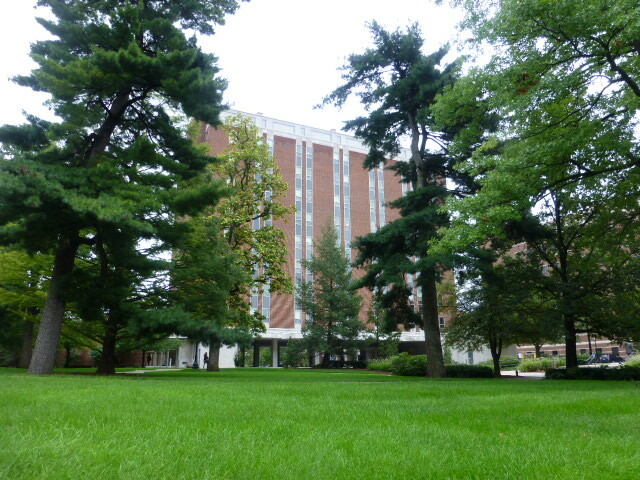 There is no residency requirement but almost all freshmen live on campus. “It cuts in half about every year after that,” said the tour guide. A total of 11,500 students live in one of 16 dorms or a learning community (each housing 30-40 students) A new Honors College residence hall is about to be built. 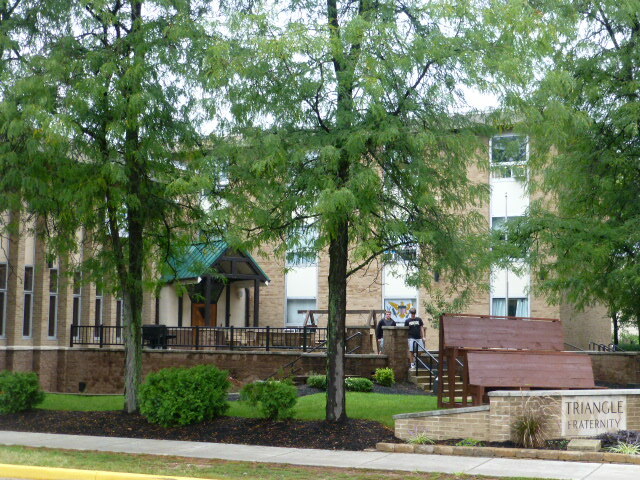 Greek housing is cheaper than other on-campus housing. Classes tend to be large. There are 2 lecture halls with 470ish seats and other halls that hold 120 students. Our tour guide’s smallest classes were 30 (Instructor-led) and 20 (TA-led). There’s support for people who want it, but no one will hold their hands. The OWL lab (writing center) is free. “It’s available online; I used it even as a high school student,” said the tour guide. However, other tutoring costs money. During our visit, there were two sessions where we had options of seeing several different departments. I first went to the anthropology department and got a tour by one of the archaeologists who works in Egypt. She took us into the osteology lab where a several-thousand-year-old Sudanese skeleton was assembled on the worktable. She showed us some of the discoveries about lifestyle, and explained what type of work the students do in the class she teaches. Eventually it will go back to Sudan, but since they don’t have facilities to store human remains for study, they’re not anxious to get it back. 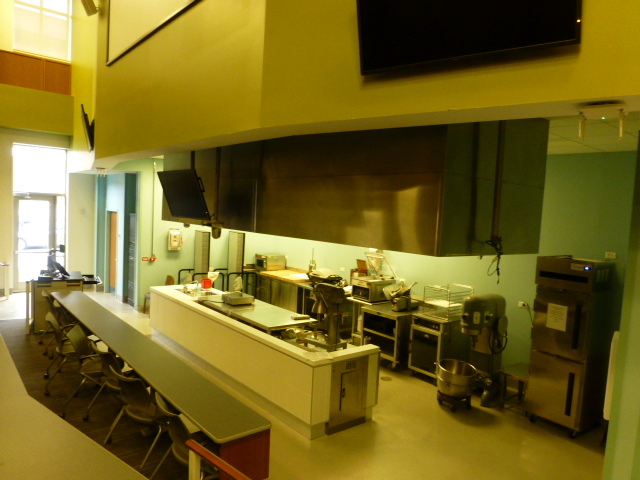 One of the kitchen classrooms for the Hospitality School. The second tour was the school of Health and Human Sciences. This encompasses everything from Hospitality and Tourism Management and Consumer Science to Nursing, Psychological Sciences, and Speech, Language, and Hearing Sciences. I talked to a Dean and a current Hospitality student. 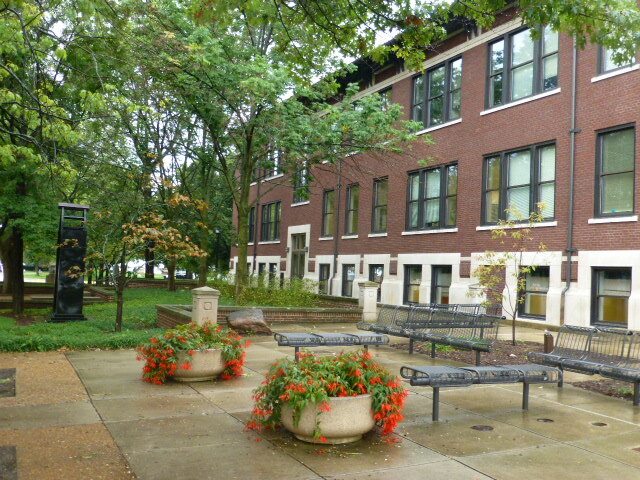 He showed off the school, including the sit-down restaurant on campus where all students must complete an internship. Hospitality and Retail. Students can specialize in things like Sporting Events or get certified in Wine Tasting. Students all complete 4 concentrations including labs and internships on campus and must also complete 3 paid internships in different positions, totalling more than 300 hours. There’s one in China at the Shangri La Resorts. The student I spoke to had all his expenses paid, including travel and uniforms. He completed a research project in Employee Retention, so he spent a lot of time with HR. PHASE (Purdue Hearing and Acoustics in Science and Engineering) which includes Acoustic Engineering and Biomedical Acoustics. A new Brain and Behavioral Science Major, popular with the pre-med crowd (as is the Nutrition Science program). Fashion Merchandising: They can spend their junior year at FIT in New York. Financial Planning (one of the majors requiring an internship). Aviation – complete with an airport on campus. Selling and Sales Management. “They do lots of improv; they know how to deal with lots of situations,” said the Dean of the College of Arts and Sciences. Education – they work in their first year. Pharmacy is # 7 in the country. Students complete 2 years of pre-pharm then 4 years of pharmacy. Film/TV and Communications is overlooked. Students must apply by November 1 to be eligible for scholarship money. They will superscore the SAT or take the highest composite ACT. They only need 1 recommendation letter which can come from the high school counselor.